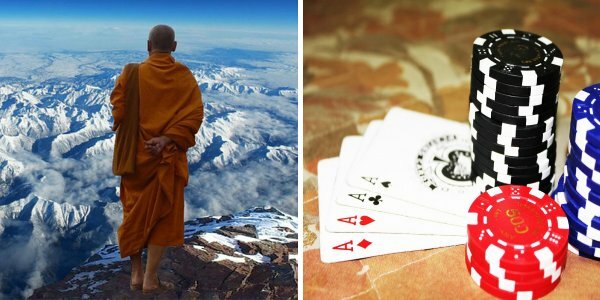 Scott Wellenbach practices Buddhism, but that doesn’t deter him from playing his favorite game — poker. In fact, the Canadian man justifies his love for the game by donating all of his earnings to charity. The 67-year-old fell in love with the game when he won a free trip to Las Vegas in 2010. Prior to the tournament, the most Wellenbach had ever won was roughly $72,000. Then, he found himself at the Bahamian tournament table, not long after winning an online championship. Recently, Wellenbach came in third place at the PokerStars Caribbean Adventure tournament in the Bahamas. His earnings? A whopping $671,240. But, the Canadian resident didn’t keep a penny of the winnings. Rather, he donated every cent to charities including Oxfam and Doctors Without Borders. Wellenbach says that his day-to-day routine varies. However, he strives to meditate for one hour each day, and spends even more time meditating when he competes in a tournament. He acknowledges that gambling is contradictory to Buddhism. However, he believes that the game offers invaluable insight on religious teachings.
? Former Monsanto Executive Picked By Trump To Lead Wildlife Agency Baby Has Heartwarming Response to Hearing Her Sister’s Voice Clearly for the First Time [Video] ?